The Indore Pears set as a pair of earrings. During an earlier case before the Bombay High Court it was revealed that the Muslim woman, Mumtaz Begum, had been a dancing girl at the Court of Tukoji Rao III, Maharaja of Indore, one of the three great Maratha states in central India. She had been one of the many concubines of the Prince, who was capivated by her, but she did not return his feelings. While the entourage of the Maharaja was travelling, the girl had jumped off his private train, escaping to Amritsar, thence to Bombay where she came under the protection of a rich merchant. It was agreed that the crime on Malabar Hill could not be ignored: Mumtaz Begum had recognized her assailants as an aide-de-camp of the Maharaja and members of the Indore army and mounted police. The Maharaja's involvement in the crime was never made public but he was asked either to appear at the subsequent official inquiry or abdicate in favor of his son. In the following year he chose the latter course. The Indore Pears set in a baguette diamond necklace. While travelling in Switzerland after his abdication, he met Nancy Ann Miller, a rich young American. Amid much publicity the couple married in 1928. The bride embraced the Hindu religion and subsequently became known as the Maharanee Shamista Davi Holkar. 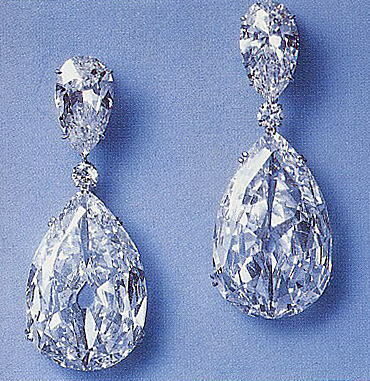 In 1946 Harry Winston bought the two pear-shaped diamonds; weighing 46.95 and 46.70 carats, which the Maharanee had worn on many occasions. 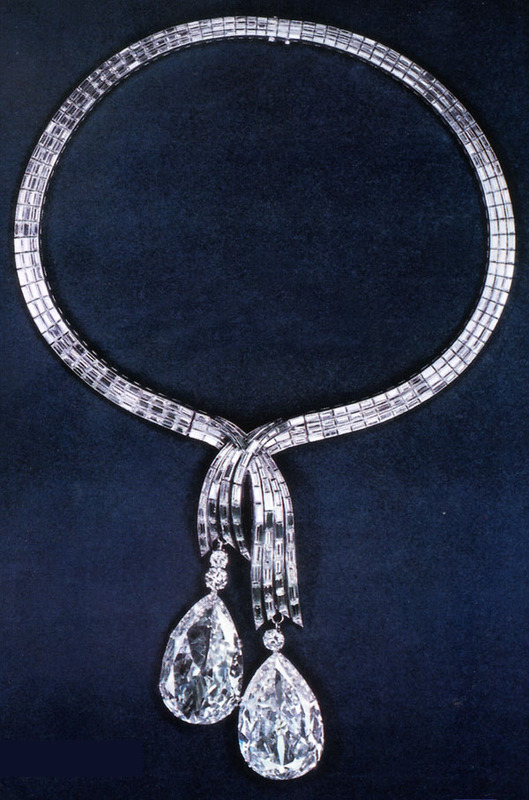 Mr. Winston had the diamonds recut to 46.39 and 44.14 carats and shown in his famous Court of Jewels Exhibition, which also featured the Hope Diamond. In 1953 he sold them to a client from Philadelphia, repurchasing them in 1958 and selling them to another client in New York. In 1976 Mr. Winston bought the Indore Pears yet again before selling them to a member of a royal family. Finally Christie's auctioned them in Geneva, in November of 1980, and again in November of 1987. Robert Mouawad is the present owner of the diamonds. Different listings for the color and clarity grades have surfaced for the pair of diamonds. The Mouawad website simply says 'E-VVS2' but at the same time a reputable Japan-based website lists them both as D-color, and one Internally Flawless, the other VVS1. Sources: Famous Diamonds by Ian Balfour and Diamonds - Famous, Notable and Unique by GIA.